This is my every morning breakfast! 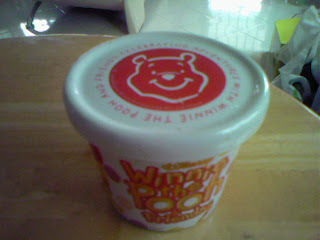 Is my favor oat meal. 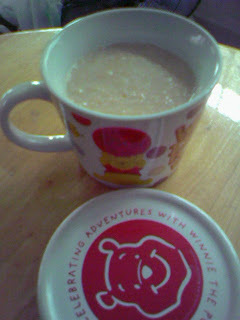 Don't know when it started... i start eating oat meal suddenly.. haha.. not even realize how i get addicted to the oat. Quite a long time ago.. i was thinking to take oat meal for my breakfast... coz i think it's really healty, but i just eat for a few weeks then stop. I think i am changing day by day... Those food that i don't like to eat when i was small... i started to accept them and love them in this few years time. See ~!! Even it's just a picture... but i still can smell the oat. For your xtra info. This is my favourite cup. Love PooH!^^ I will treasure you my little cutie cuppie.. See you in the morning.